Arrochar to Coulport. 14 Miles. Day 2 of Michael’s walk and he decided to change from his walking boots to trainers which made life a bit easier for him. 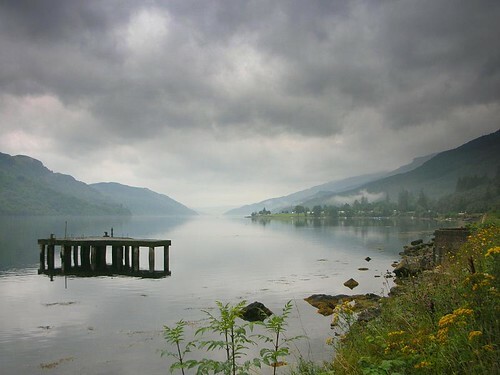 Today the weather was the usual dreich misty rain but it didnt matter that much as most of the walk was to b e down the A814 which runs the length of the east shore of Loch Long. For most of the day the loch was obscured by bushes and trees anyway so we didnt really get a chance to see much. We did see an usual Chinese garden by the side of the loch about half way down with a pagoda and the works. By the time we had reached the outskirts of Garelochhead we were pretty wet and the rain had done its business and managed to work its way through the wet weather gear we had on. Even Arfur was looking a bit pissed off. We stopped at the beginning of the dual carriageway that led to the refuelling base at Coulport. If Michael hadnt been with me at this point I could honestly say I would have been hard pressed to stay positive about this walk. 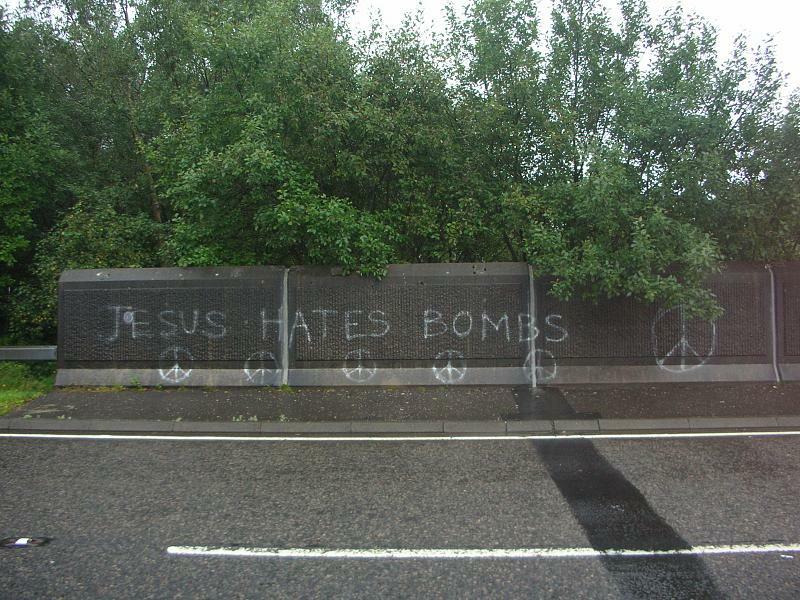 Near a bridge that had “Jesus hates bombs” written on it, we stopped and ate some soggy sandwiches. Then we had a long drag up and over the hill along the dual carriageway down to the Coulport base. A police car stpped and enquired what we were up to – Obviously wondering what a couple of dishevelled soaked middle aged men were doing walking along a military zone. I was also beginning to wonder myself what I was doing at that point. This entry was posted on Sunday, August 31st, 2008 at 11:42 pm and is filed under life, photography, Scotland, trail, Travel, trek, Uncategorized, walk. You can follow any responses to this entry through the RSS 2.0 feed. You can leave a response, or trackback from your own site.